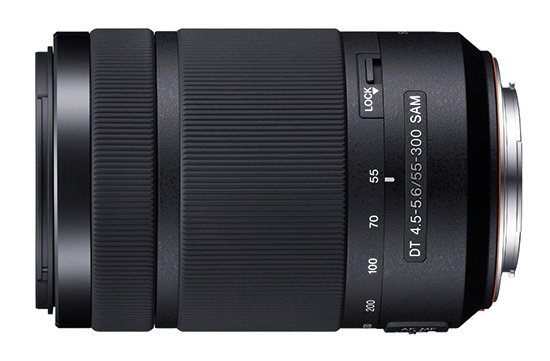 Sony announced their new DT55-300mm f/4.5-5.6 SAM telephoto zoom lens for A-mount cameras. The price is $299. SAN DIEGO, July 25, 2012 /PRNewswire/ -- From flattering portraits to faraway wildlife and fast-action sports, nearly every subject can be captured beautifully with the new SAL55300 telephoto zoom lens, the latest addition to Sony's A-mount lens lineup. Optimized for use with α A-mount camera models with APS-C sensors, the compact, stylishly-designed interchangeable lens is an ideal addition to the camera bag for any Sony photographer. "The new SAL55300 lens is a perfect complement to our acclaimed line of alpha A-mount cameras with Translucent Mirror Technology, allowing consumers to capture distant, faraway subjects with razor-sharp focused images and Full HD videos," said Mike Kahn, director of the alpha business at Sony Electronics. "With a versatile 55-300mm, 5.5x magnification range, fast, quiet performance and an attractive price tag, it's a welcome addition to our alpha A-mount system." The new SAL55300 lens features a whisper-quiet Smooth Autofocus Motor (SAM) and an advanced optical design to get the best from the high-speed performance and high resolution sensors common to Sony's A-mount camera lineup. Additionally, it contains an ED (Extra-Low Dispersion) glass element, commonly featured on premium Sony G Lens models, that reduces color aberrations, improves image quality and provides excellent contrast and corner-to-corner sharpness. The new SAL55300 A-mount interchangeable lens for A-mount cameras will be available in September for about $300 at Sony retail stores (www.store.sony.com) and other authorized dealers nationwide.